Next up is a live set from one man, fusing two special identities that are known and loved throughout the world of Acid & Techno. 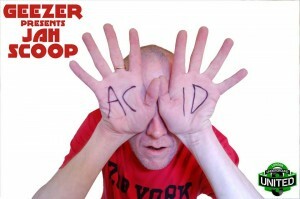 He is another character that was instrumental in the birth and development of the underground Acid Techno sound that is unique to London, and has produced many anthemic floorfillers that have defined the genre. He also helped give birth to the Techno / Heavy Dub fusion which was originally found on labels such as Highwire in the early years, and these grooves have now flourished in his style to produce many rocking releases over the years. He will be fusing this jump up Reggae Techno sound with his trademark heavy rolling beats for an extra special set, that will be sure to help us get fresh at the weekend… Introducing the R.A.W. sounds of: GEEZER PRESENTS JAH SCOOP! This entry was posted in Event focus, Events and tagged Jah, london, Scoop, The Geezer, Underground, United. Bookmark the permalink.